When it comes to meal time, do you sit at the table or stand and graze? For the longest time, I’ve been a grazer. Heck, when you’re single, what’s to stop you from foregoing a plate entirely and noshing straight out of the pan? So bad, I know. What’s worse, I eventually turned Morgan into a grazer, even though he preferred a sit down meal. And he’s not the only one to adopt my lazy ways. Then last year, I decided to turn that all around. No more eating at the trough. Being a newlywed, it was all part of the “nesting” thing. When I looked to the Web for inspiration, I stumbled across the Sunday Supper Movement. Perfect! 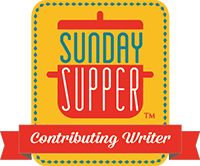 Eventually, when I relaunched this site in July, I became a participating member, and I’m so honored and excited to be here to celebrate Sunday Supper’s one year birthday. This week, I’m bringing to the table an incredible Easy Italian Wedding Soup, inspired by none other than the Sunday Supper Movement founder, Isabel aka Family Foodie. You might be surprised to learn that Italian Wedding Soup has nothing to do with weddings at all and is, in fact, a mistranslation of sorts. Minestra maritata, literally “married soup,” refers to the combination of meats with greens. In Italian, to say two things go well together, they are said to be married, or maritata. This age-old Neapolitan staple was loaded with lots of meats and greens–much heartier fare than today’s standard Italian-American version. 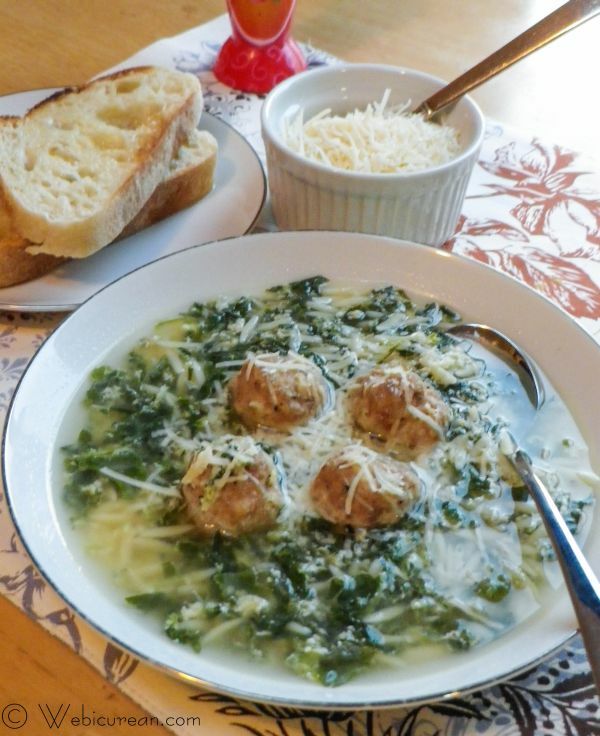 Isabel’s Easy Italian Wedding Soup is quite filling, though, as it’s chock full of mini pork meatballs, but the delicate blend of chicken broth, spinach and a little pasta help keep it light. It’s super easy to prepare, too, and as we work our way through another cold snap here on the Left Coast, I was glad to have a steaming bowl of this soup to keep me warm. First, let’s soak that french bread in the milk. Once it’s all good and soggy, squeeze the milk out (yes, with your bare hands), and put it in a larger mixing bowl for the meatball mixture. 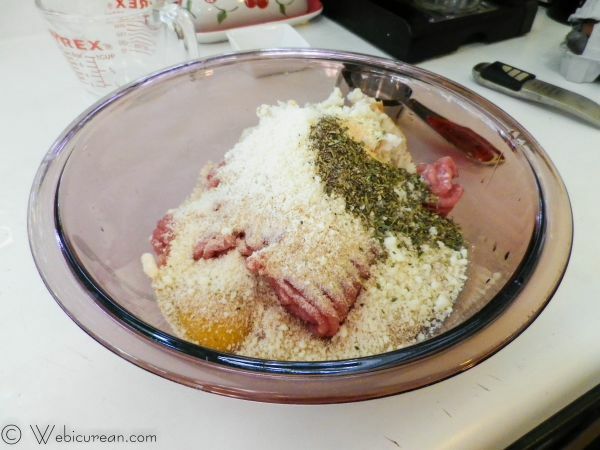 Add the remaining meatball ingredients to this bowl and mix well. You should start with a wooden spoon and finish off mixing with your hands for best results. What can I say? Meatballs are messy business! Preheat the oven to 375F, and get your pan ready. Scoop (2 teaspoons) the meat mixture and shape into little balls, lining up on the pan about 2 inches apart. Bake these bad boys for 10-12 minutes or until no longer pink inside. While the meatballs are baking, put the chicken broth in a large stock pot and bring to a boil. Blend the spinach, eggs, Parmesan cheese and white pepper in a bowl. Then drop by the spoonful into the boiling broth, stirring well after each addition. Reduce the heat and let simmer for a couple of minutes. Now add the meatballs and Orzo pasta to the soup and let simmer an additional 20 minutes or until the pasta is done. Serve piping hot with a little Parmesan on top and a crusty loaf on the side. Enjoy! 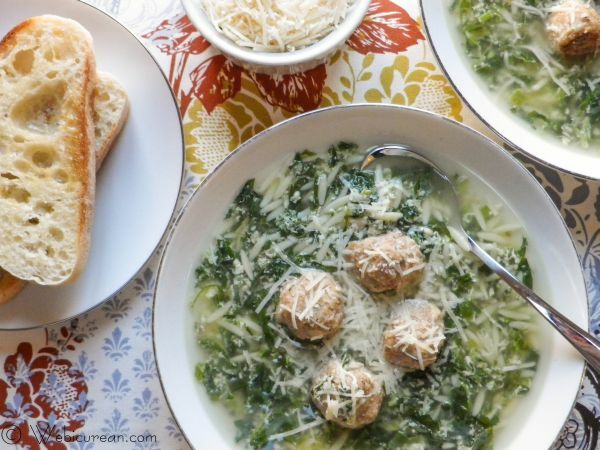 A delicate blend of chicken broth, spinach and pasta, and chock full of mini pork meatballs make this easy Italian wedding soup perfect for a cold winter's day. Drain spinach, squeezing all the water out. 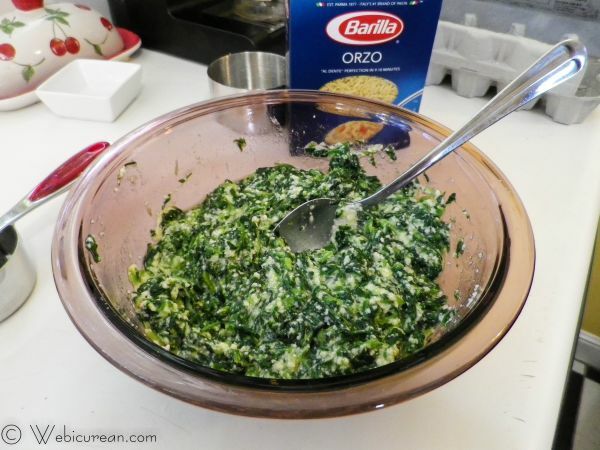 Mix spinach, eggs, Parmesan cheese, and white pepper in a bowl. In a large pot, bring chicken broth to a boil. Drop spinach mixture by the spoonful into the boiling broth, stirring well after each addition. Lower heat and simmer about two minutes. Add the Orzo pasta and meatballs, and simmer for an additional 20 minutes, stirring occasionally, until the pasta is cooked through. These mini pork meatballs are bursting with flavor and the are the perfect addition to Italian wedding soup. In a medium bowl, soak the bread in the milk until soggy all the way through. 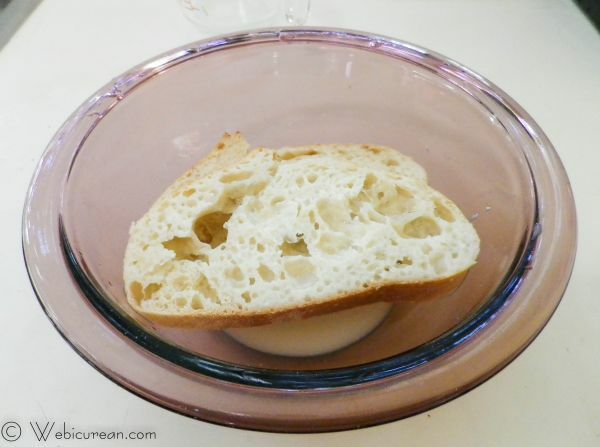 With your hands, squeeze the milk out of the bread and place in a large bowl. Add the remaining ingredients and mix well with a wooden spoon (or better yet, use your hands). Line a cookie sheet with foil and spray with a non-stick cooking spray. 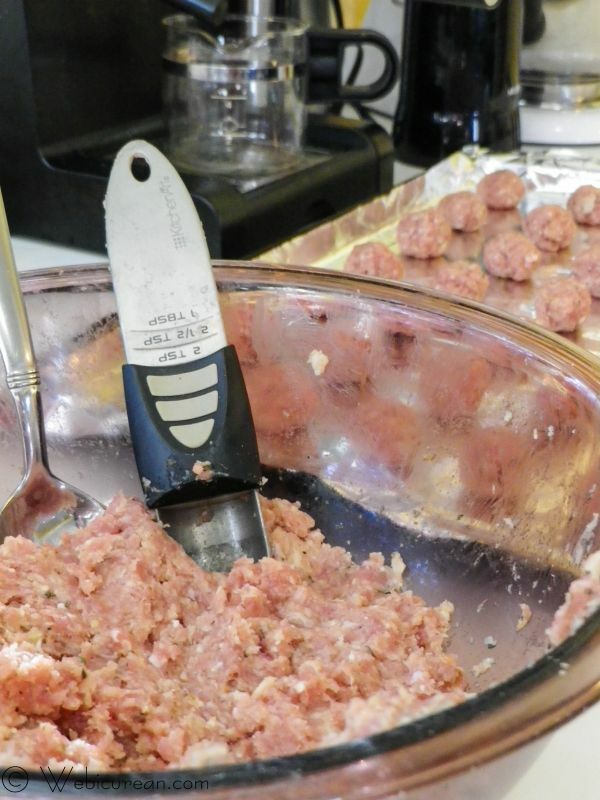 Using a small cookie scoop (ie, two teaspoons full), shape the meat mixture into small balls, and line in rows on the cookie sheet about 2 inches apart. Bake for 10-12 minutes or until done. We are celebrating this weekâ€™s birthday event by choosing recipes from contributors that have inspired us in the past year.Â With 52 weeks of inspiration, it was hard to pick just one. Let’s see what others are serving up. Would you like to join the Sunday Supper Movement?Â Itâ€™s easy. You can sign up by clicking hereÂ â†’Â Sunday Supper Movement. Anne, I love that you used one of Isabel’s recipes. Your wedding soup looks absolutely delicious, hearty, filling, yet also light and nutritious. I could totally go for a giant bowl of it right now! Happy Sunday! Wonderful to learn about the history of Italian Wedding Soup. And equally wonderful that you shared this perfect-for-winter soup. Thank you, Anne! I had no idea the history all all. Awesome recipe that I know my family will love. So glad you shared one of Isabels recipes. This recipe is on my to-make list! It’s one of my favorite soups. BTW, beautiful photos! Italian Wedding Soup is one of my all time favorites and you just reminded me its been a while since we have had it. After seeing your beautiful pics I know I have to remedy that soon! I made this soup a few weeks ago and it was delicious! 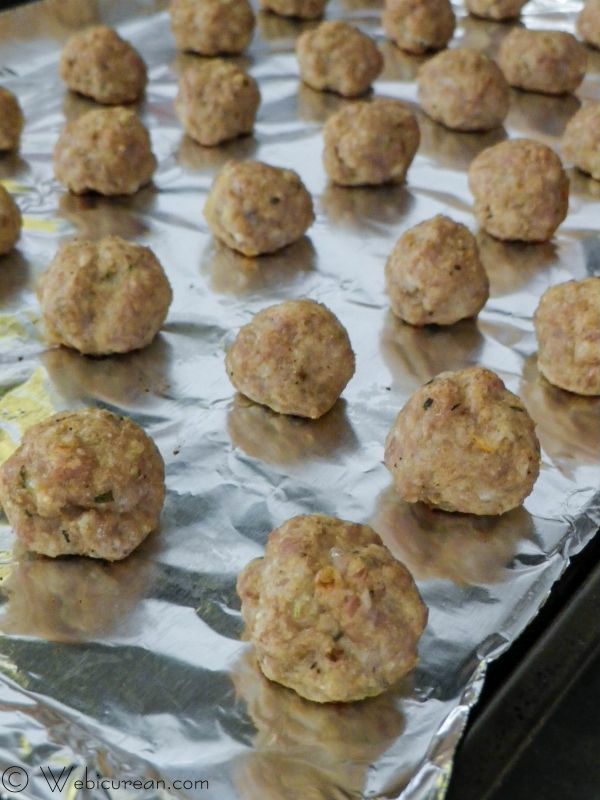 Your meatball recipe sounds great too. Mmm those meatballs look so delicious. This is on my must try list! Fabulous soup! I have been wanting to try this soup for a while and this recipe looks and sounds like a great fit for my family. Thanks for sharing it for Sunday Supper. Beautiful bowl of soup!! 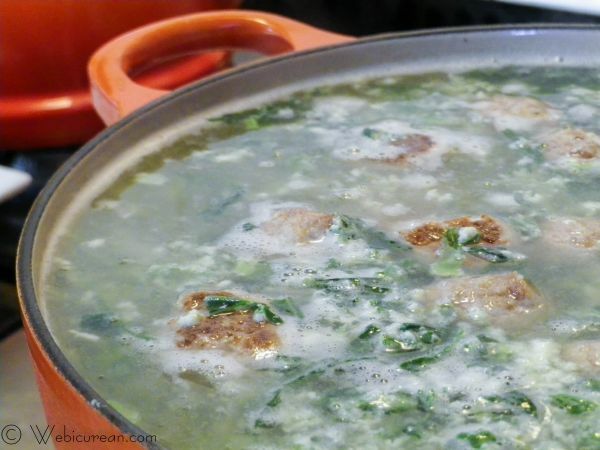 Italian Wedding Soup is one of my favorite soups. You have outdone yourself with this one!! Wow, this soup looks amazing! I love the meatballs! What a beautiful soup! Even if it’s not actually for weddings, I think you could get away with it at a winter wedding! Yum! What a comforting and delicious soup. So perfect for these super cold nights! Wow, it looks amazing for such an easy recipe! Those meatballs are calling my name, I love them with pork! I love soup and this is one of my favorites for sure, your pictures make my mouth water!! I am so honored your chose one of my recipes to celebrate this memorable event! Thank you for your amazing and inspiring recipes every week. I have so many of your beautiful recipes on my mus try list. If it tastes half as good as it looks this is a winning recipe! What a unique way to make meatballs! This soup is so intriguing I am going to have to try it as well. Yum! Okay, I’m drooling! DROOLING! I need to make this one too! Jen @JuanitasCocina recently posted..Pulled Pickled Pork ~ #SundaySupper Turns One! This soup looks delicious!! I love meatballs and will have to try this soon! This looks so good! A must try for sure. It’s the season for hearty soups and this one looks like a must add. My husband definitively would love this soup! !I hope mine would look as tasty as yours. This looks amazing and I think would satisfy even my hubby who doesn’t think soup is a meal. Always wanted to make Italian soup & this looks like such a wholesome recipe ! Yummm ! On my bucket list ! If it wasn’t 75 degrees today I’d be making this soup. Too hot though. I’m saving the recipe for the next cold snap. There has to be another one soon. I LOVE Italian Wedding Soup!! This looks perfect for a day like today–rainy, grey and miserable. In fact, I’m tempted to run to the store to buy ingredients for this! An extra serving for me please! It looks so good. Great post! I’ve not had this before, but it looks fantastic. Perfect for a cold day like today! What a stunning bowl of soup! And I bet it tastes amazing! Can’t wait to try this. I think I want to make this soup with swiss chard. Doesn’t that sound lovely too. Winter weather always make me want soup and this soup would make me so happy right about now. My stepbrother’s been bugging for this lately, definitely bookmarking! Sarah recently posted..Beef Stroganoff for #SundaySupper’s Birthday! This soup looks so good, Anne! Love the way you make the meatballs. Thank you and Isabel for the great recipe! I love Italian Wedding soup. You can make it over and over and never make it the same way! Change the greens, kind of meatballs, etc. Cindys Recipes recently posted..My New Gardening Series at FFF Daily Dish! I used ground turkey instead of the pork and that was really good. Lovely — I have always loved cooking meatballs in the oven instead of forking them around a frying pan! The Frugal Gourmet (Jeff Smith) used to be on PBS and shared that trick. Been doing it ever since!! I have also added in a can of small navy beans, drained, to increase the fiber. Thanks for sharing this recipe! So glad you enjoyed it! Baking them is SO much easier, isn’t it? I used to watch the Frugal Gourmet all the time–in fact, I have one of his cookbooks! I really should dig into it again–it’s been way too long! Hi! Your Italian wedding soup has been nominated as one of the “Best Italian Wedding Soup Recipes on the Net”. To vote for it, please visit http://easyitalianrecipes.org/soup-recipes/best-italian-wedding-soup-recipes-on-the-net-vote-for-your-favorite/ (your recipe is positioned at #122). Thanks for the enlightening and entertaining history /lowdown on one of my all time favorite foods. But in breaking with tradition and almost all variations on it: I usually use ground LAMB, lots of fresh Spinach and sometimes switch out the Orzo for Achini de Pepe OR lately, Mediterranean/Israeli/Pearl Couscous. And if I happen to have some Mushrooms (wild…) to saute ~ they go in too. I could eat this blissful concoction all day long! Hi Jesselyn, thanks for stopping by! I can’t wait to try your suggestions–the lamb sounds especially tempting with the pearl couscous. I’ve been on a huge maitake mushroom kick lately–I’ll bet they’d be perfect in there! Does this recipe freeze well? If so, how should i go about freezing? Hi Melissa–so sorry for the delayed reply–I just found a bunch of blog comments trapped in my spam folder! I’ve never tried freezing this, so I couldn’t say for sure; however, I see no reason why this wouldn’t freeze well. I often freeze broths for later use, and that always works out well. I just freeze stuff like this in plastic containers such as Tupperware. Leave a little space at the top so it has room to expand. Hope this helps! Two of my favorite things: Italy and weddings. This looks delish.